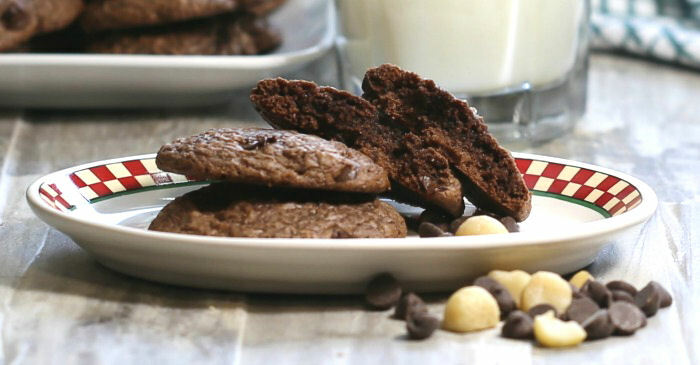 Brownie Cookies From a Mix - These Awesome Brookies Rock! 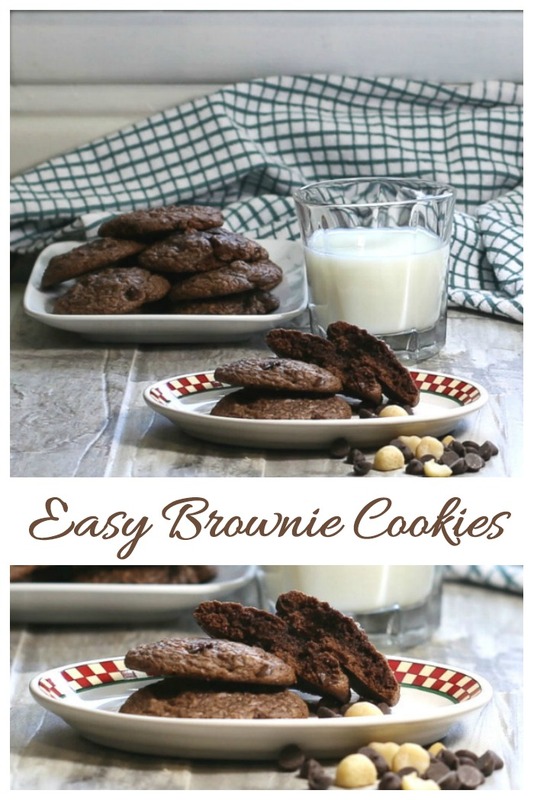 Brownie Cookies From a Mix – These Awesome Brookies Rock! Short on time, but big on the desire for treating your sweet tooth? 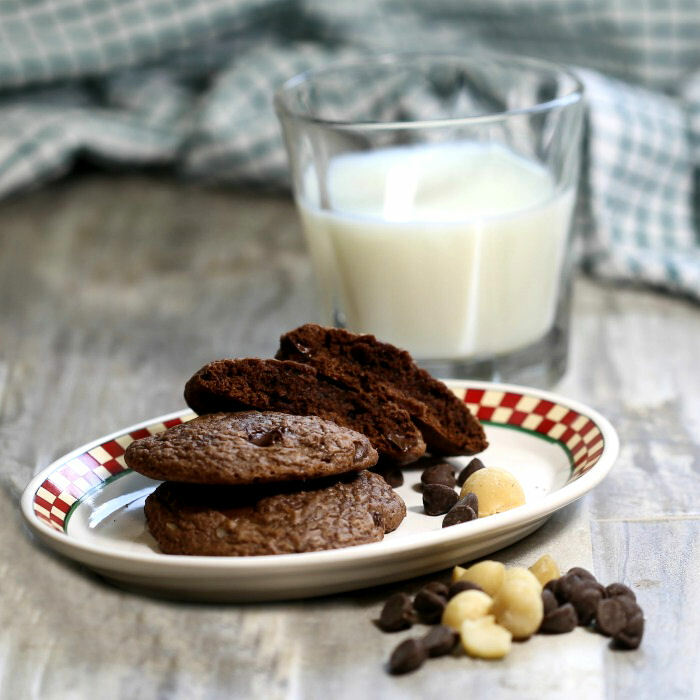 These brownie cookies from a mix are a semi home made way to make snack time tasty in a flash. Get the scoop on making these “brookies” with my step by step tutorial. Have you ever heard of the term brookies? When cookie dough is baked together with brownie batter, the finished result is a chewy, fudgy dessert that combines the tastes of both brownies and cookies. It elevates the taste of each one to a whole new level. Brownies have been around since 1905 when Fanny Merrit Farmer came up with a tasty version. And the earliest cookie type desserts date back to seventh-century Persia. Brookies are a much more recent invention, and have come about because so many online cooks are trying to come up with interesting versions of tried and true recipes. Brownie + cookie dough = Brookie. But should the end result look like a square, or look like a cookie? What about making both tastes in a muffin tin instead? Maybe that should be called a mookie! The dessert appears to have started out as a bar shape, but seems to have morphed into a rounder cookie shape over time, so that now the answer is “either way is just fine!” I’ve seen recipes where the brownie mix is topped with cookie batter and then cut into squares. And then, as in this recipe, I’ve seen recipes where the two tastes are combined into a round cookie like shape. So, it depends on what you are going for in the dessert. Today, for me, it’s cookie time! I keep brownie mixes on hand in my pantry all the time but I rarely use them just to make a plain fudge brownie. I like the ease of using the mix but also like to add in some extra flavors to make them seem more home made when I am short on time but the family is asking for a “homemade” dessert. 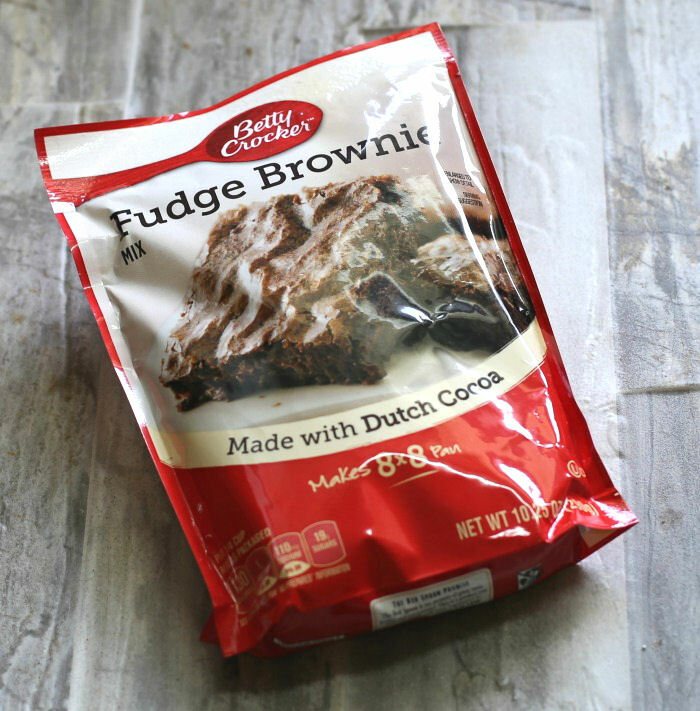 My Betty Crocker brownie mix has the fudgy brownie part of the brookie down pat, so all we need are a couple of baking ingredients and some extra chocolate chips. To get a cookie-like texture, we need a bit of extra flour and less oil that is normally called for in the brownie mix directions. I also did a brownie add in recipe using applesauce a few weeks ago. Be sure to check out the lightened up M & M brownies here. And to make the brookies extra fudgy and rich, we’ll be dumping in some semi sweet chocolate chips and macadamia nuts. The end result is a chewy, fudge like texture oozing with extra chocolate richness and a nice crunchy texture. The batter for this dessert is thick. I know that one of the best things about a brownie mix is that you can just whip up the batter with a spoon, but trust me on this one – get out the mixer. Unless you want your daily arm workout. Use a paddle attachment if you have one, and then you can also use it to fold in the nuts and chocolate chips. This batter is stiff! A mini muffin scoop will make sure that your brownie cookies end up all the same size. It gives a nice dome to the batter that cooks down and allows the center to stay moist and fudgy, for a brownie like texture. 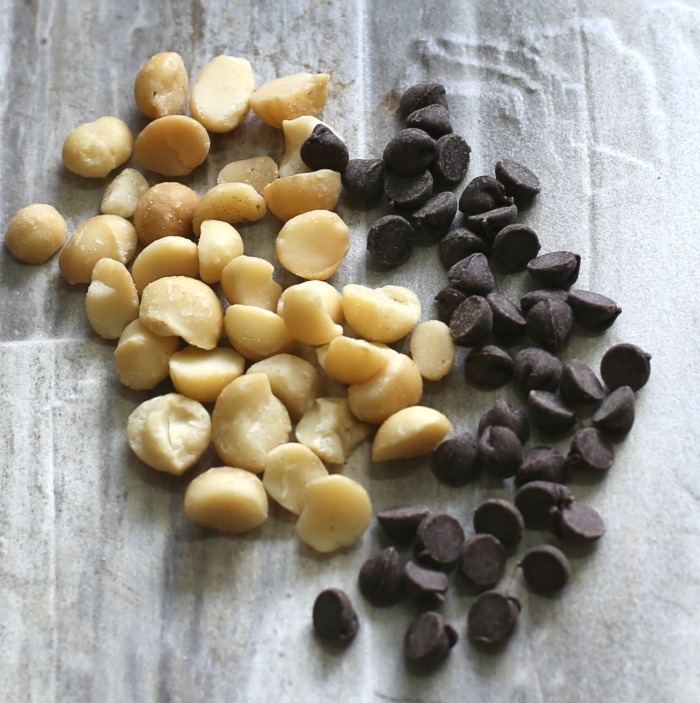 Macadamia nuts and semi sweet chocolate chip add-ins will elevate this cookie to a gourmet shop level. Your family and friends will never guess that the cookies started as a brownie mix! 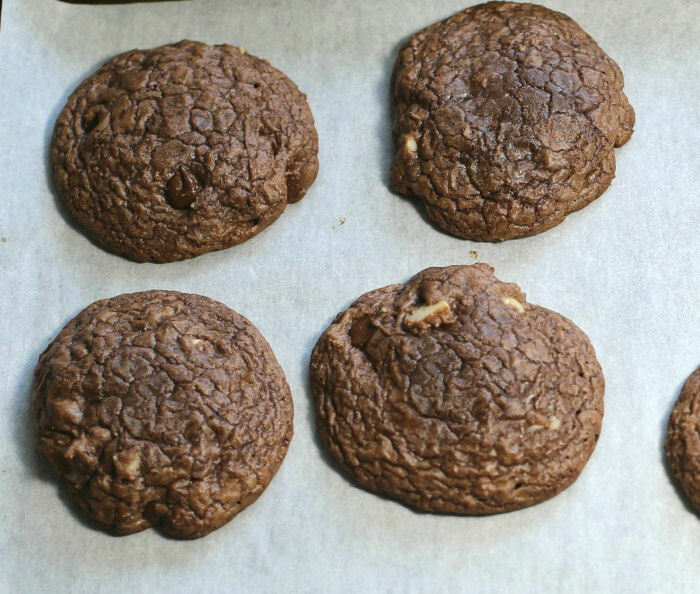 The brownie cookies will have a smooth finish when you take them out of the oven. While still on the baking sheet and warm, give the sheet a good tap on the counter. It will break the top layer of the cookies for a more crinkly look. 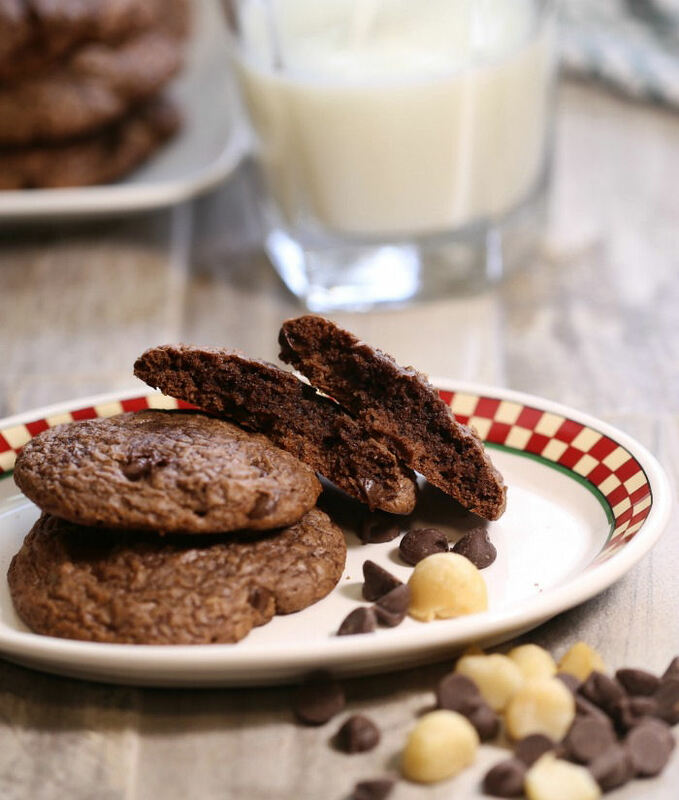 These yummy cookies have a fudgy center with a bit of extra chocolate goodness in every bite. They are crispy on the outside like a cookie with a soft center that is chewy like brownies. And they have a nice crunchy texture from the chopped macadamia nuts. The cooking time for this recipe is short on purpose. You will want the cookies to have a warm, soft fudgy center, so take them out of the oven a bit before they are finished cooking. Even one extra minute could dry them out, so test as you go to get the right consistency. Use a mixer. This dough is stiff and a whisk or wooden spoon won’t be able to mix the ingredients well enough. A small muffin scoop gives you even sized cookies every time. Fun and easy dessert idea: Add some ice cream between two brookies for a truly delicious ice cream sandwich. 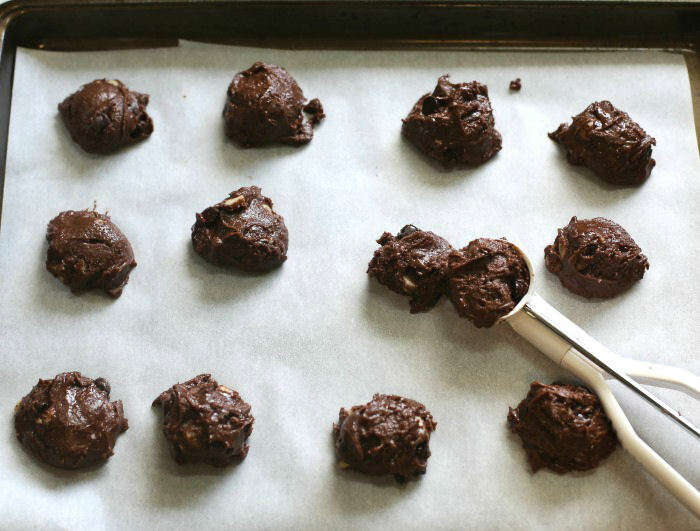 This recipe makes 25 good sized cookies, each with approximately 159 calories. 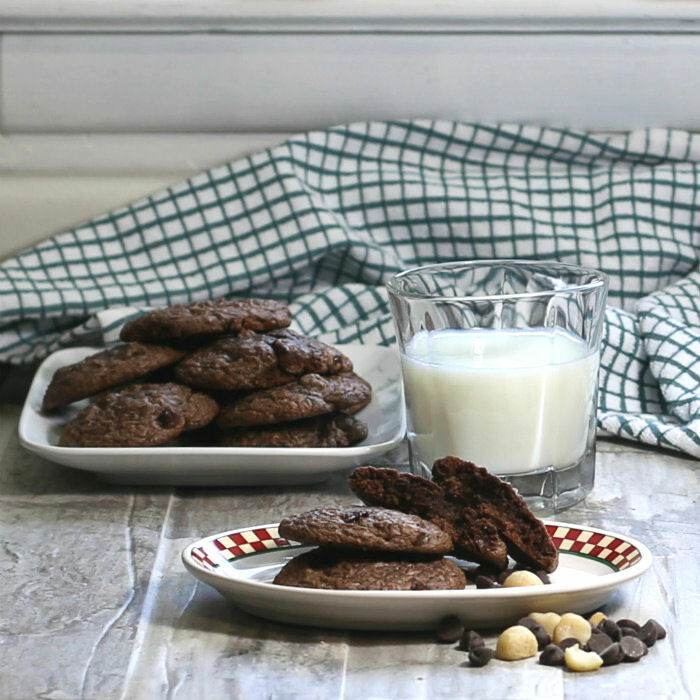 Want a reminder of these cookies made with brownie mix so that you can find it easily later? Pin this image to one of your Pinterest dessert boards for easy access. What another brownie add in recipe? Try my rich chocolate brownies that use peanut butter morsels to make brownies that taste like Reese’s peanut butter cups. These brownies cookies are made from a mix but have some extra love in the form of rich chocolate chips to give us a homemade like taste in a flash. Preheat oven to 350 º F.. Line a baking sheet with parchment paper. 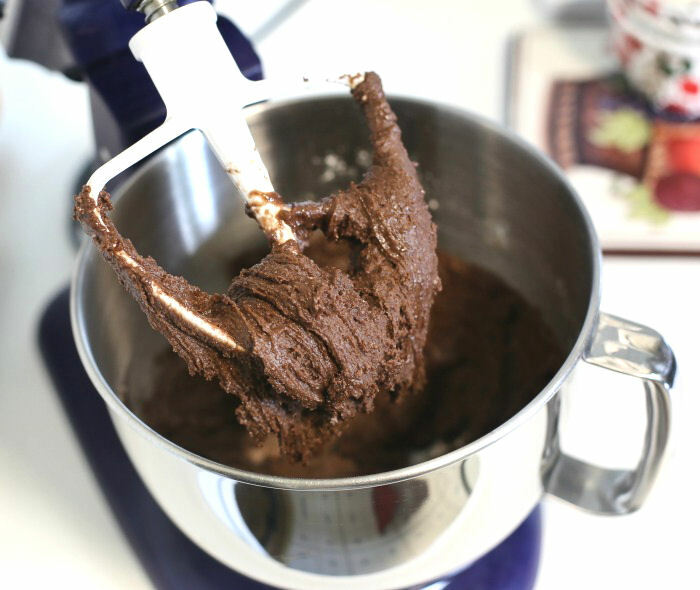 In the bowl of a stand mixer, beat the brownie mix, eggs, flour, oil and water to a smooth mixture. Fold in the semi sweet chocolate chips and chopped macadamia nuts. Use a small muffin scoop and scoop out 2 tbsp of the dough and place on the baking sheet about 2 inches apart. Bake the brookies for 11-12 minutes. Be careful not to overcook, or the cookies will have a dry center. Remove from oven and cool for 2-3 minutes before transferring to a wire rack to finish cooling. Store in an air tight container. The brookies can also be frozen for about 3 months. Note: The cookies come out of the oven with a smooth top. To get a cracked "cookie like" top, just tap the cookie sheet on the counter a few times while the cookies are still hot.